People with dyslexia have difficulty learning to read but may be not have difficulties in other intellectual functioning. People think dyslexia involves difficulties in seeing letters, words and sentences—that dyslexics see letters or words backwards or that they read text from right to left rather than from left to right. There is some evidence that dyslexics have difficulty processing visual information rapidly. Most scientists studying dyslexia believe that dyslexia involves difficulties in processing sounds rather than difficulties in processing visual images. Most dyslexics have normal vision and do not see text differently than normal readers. They do, however, have considerable difficulty in attaching sounds to the text they are seeing. The language we use is made up of individual sounds that are called phonemes. Children who will become dyslexic have difficulty in accurately learning the phonemes that make up their language. One way to think about this difficulty is to imagine two audio tape recorders; one that is expensive that captures sounds with great clarity and precision, and a second cheap one that blurs the distinction between similar sounds. Individuals who will typically become good readers are equipped with the expensive sound recorder while individuals who will become dyslexics are equipped with the cheap recorder. Difficulties in learning the sounds that make up language (phonemes) have a number of early consequences that precede difficulties in learning to read. One consequence is that children who will develop dyslexia sometimes have delays in learning to speak, and they sometimes develop difficulties in correctly pronouncing words when they do speak. Difficulties in correctly pronouncing words are called articulation disorders and many children who are identified with articulation disorders receive speech therapy to correct the difficulties. Speech therapy may not, however, correct the source of the problem and children who successfully get beyond articulation problems may still develop dyslexia. 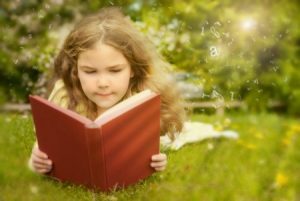 Learning to read typically follows a sequence of skill development beginning with learning the names of letters and ending with the ability to effortlessly extract the meaning from sentences, paragraphs, and even books. There are a number of important steps though between the starting and ending points. After learning the names of letters, most children learn the sounds that letters make, and then they must learn to automatically identify words in context so that they can comprehend what they are reading. Individuals with a phonological core deficit find it very difficult to learn reading skills that involve attaching sounds to letters and words. The difficulty in attaching sounds to letters and words delays, and in some cases, blocks the development of skilled reading comprehension. Normal readers quickly move from sounding out words to automatically recognizing words. Automatic word recognition means that there is no thought involved in word recognition; the reader looks at a word and the meaning of the word automatically pops into the reader’s conscious awareness. Dyslexic readers have difficulty attaining this automatic state and typically struggle with word recognition. The reason for the struggle with word recognition relate back to the phonological core deficit problem. When we read we have specialized processing mechanisms in our brains that quickly (very quickly) transform letters and letter sequences into sounds and then transfer those sound patterns to the speech recognition areas of the brain. In essence, reading is word decoding (transforming letters making up words into sound patterns) plus speech comprehension. The phonological core deficit that prevents the easy capture of phonemes also inhibits the rapid transformation of letter sequences into sounds that can then be interpreted by the speech processing area of the brain. Early screening procedures in kindergarten and grade 1 can identify children who are at risk for developing reading problems. Children who will develop dyslexia can often be identified even before the child begins to read (kindergarten and grade 1 children). Intervention procedures can then be used with this at-risk population to greatly reduce the incidence of reading problems. Methods for identifying children beyond the 2nd grade who may have dyslexia. One technique for identifying dyslexia after second grade involves administering measures of intellectual ability (IQ tests, for example) and measures of reading performance. If a child has normal or above normal intellectual ability, but well below normal reading ability, then there is a good likelihood that the child has dyslexia. This procedure involves administering an intellectual measure and a reading measure and is the traditional means of identifying dyslexia. The discrepancy method has critical flaws and more modern procedures have been suggested as diagnostic procedures. One such method is called the “response to intervention” method. This method involves providing children with the best possible instruction and if they don’t respond to that instruction, they are likely to be dyslexic. One obvious difficulty with this procedure is that if a child has been exposed to the best possible instruction and doesn’t respond, what do you do then? Another method for identifying dyslexia is the used in the Reading Success Lab software. This method involves a series of reading tasks and examination of the performance profile on the tasks. The two graphs below illustrate this method. identifying pseudowords (e.g., plok), activating word meanings, understanding sentences, and listening and reading comprehension of page length material. The graphs show grade level percentile on each of the tasks. The first graph is the typical profile one sees with children who are poor readers, but not dyslexic readers. In contrast, the second graphshows the typical profile for a dyslexic reader. The differences are obvious. The poor reader is below average (below the 50th percentile) on all of the tasks, while the dyslexic reader is above average on the simple task, the letter task, and the listening comprehension task, but well below average on the remaining tasks that require the processing of the sounds of words. A final procedure that could be used to identify dyslexia is to take a child to a medical or research facility that can conduct fMRI analyses, and see which parts of the brain become active while the person is reading. At this time this is not a reasonable diagnostic procedure and fMRI analysis of reading activity is strictly a research procedure and is not used for diagnostic purposes. Research has shown that up to 20% of children beginning school in the U.S are at-risk for developing a reading problem. The most effective procedures for correcting reading problems are those that are implemented early. There is a substantial body of research showing that intensive early screening procedures that identify and then remediate weak letter identification skills, weak letter sound skills, weak phonological processing skills, and weak word decoding skills can reduce the population of reading problems to approximately 5% of the total population of readers in our schools. There is a good chance, however, that the 5% of readers who do not respond well to early interventions are readers who have dyslexia. Schools that do not offer early screening and early intervention programs often wait until 3rd grade, or even beyond, to identify readers who may be dyslexic. Almost all students who are formally identified as having a specific reading disability (dyslexia) receive treatments that are based on some type of phonics based instruction. Phonics based interventions are based on the premise that problem readers have difficulty in attaching sounds to letters and to then blend sounds to identify words. Phonics based interventions work well for some children, but certainly not for all children. In fact, there is the possibility that continued use of phonics with dyslexic children may even be harmful with respect to the ultimate development of skilled reading.